Designed not just for travel but for exploration, the Celebrity Xpedition is outfitted to cater to the desires of its adventurous guests as they cruise in comfort on year-round sailings to the exotic and legendary Galapagos Islands. 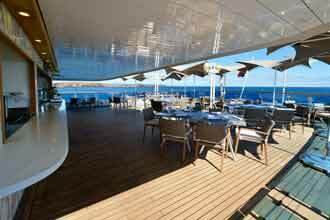 Impeccable service, comfortable staterooms and delicious gourmet cuisine is offered on this lovely intimate ship. More like a private mega-yacht, the Celebrity Xpedition is in a class by itself, offering personal attention to less than 100 guests, who can expect the highest level of service and cuisine that Celebrity is known for. 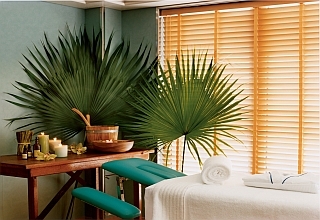 The only ship of its kind in the Celebrity Cruises fleet, the unique and environmentally-friendly Celebrity Xpedition also features Celebrity's highly acclaimed amenities. Two fabulous dining choices are offered, Darwin’s Restaurant and the Beagle Grill, a spa featuring a hot tub, sauna and sunning area, plus a fitness center, library, bar and lounge. Darwin's Restaurant, the five-star main restaurant, is beautiful and traditional, with white linen and crystal glasses. 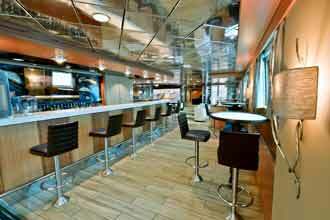 Though elegant, casual open-seating is offered in addition to personalized service and delectable culinary creations. Savor delicious fresh cuisine of locally grown organic fruits and vegetables and traditional choices. The casual buffet-style Beagle Grill, boasting stunning views, serves fabulous dishes and salads, including grilled-to-order options and different themed buffets for lunch. For added convenience, 24/7 room service is available from an extensive menu. Nightly enrichment lectures and presentations are given at the Discovery Lounge, offering fascinating and informative talks on local history and ecology. Interesting and informative lectures provide an insight into the region and its wonderful animals. Reflect on your exciting day at the outdoor wood-paneled Blue Finch Bar, the perfect place for a relaxing drink and beautiful views. Make moonlight toasts under the stars and view them through a telescope, for a special experience. 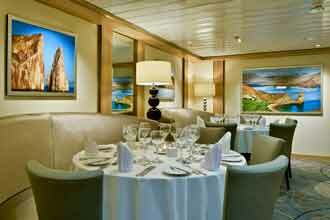 Cruise on the Celebrity Xpedition year round to the fabled Galapagos, one of the most beautiful and fascinating pristine places in the world. Select from a variety of amazing 7-, 10-, 11- and 13-day cruises roundtrip from Baltra, Galapagos or sailing roundtrip from Quito. 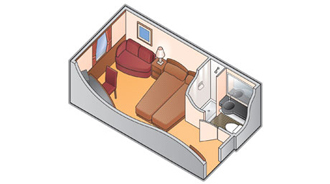 Suite Features: private veranda, free Internet access (3-hour package), leather key holder, two lower beds, convertible to queen (except as noted), Sitting area with convertible full size sofa bed (holds an adult or two children under 100 lbs. each), dual voltage 110/220 AC, plentiful storage space in your bathroom and wardrobe, flat screen TVs with DVD players, direct-dial telephone, individual safe, desk, thermostat-controlled air conditioning, private refrigerator, Mp3 docking station. Veranda: 150 sq.ft. 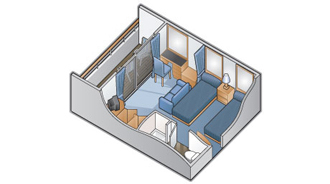 All staterooms include: two lower beds, convertible to queen (except as noted), sitting area, plentiful storage space in your bathroom and wardrobe, flat screen TVs with DVD players, direct-dial telephone, individual safe, desk, thermostat-controlled air conditioning, private refrigerator, Mp3 docking station. 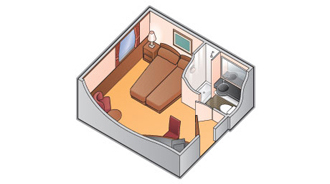 In Stateroom 301, beds cannot be separated. Suite Features: private veranda, free Internet access (3-hour package), leather key holder, double bed (cannot be separated), sitting area with convertible full size sofa bed, dual voltage 110/220 AC, plentiful storage space in your bathroom and wardrobe, flat screen TVs with DVD players, direct-dial telephone, individual safe, desk, thermostat-controlled air conditioning, private refrigerator, Mp3 docking station. Veranda: 48 sq.ft. 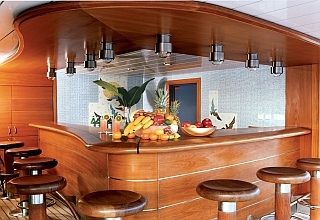 All staterooms include: two lower beds, convertible to queen (except as noted), sitting area, plentiful storage space in your bathroom and wardrobe, flat screen TVs with DVD players, direct-dial telephone, individual safe, desk, thermostat-controlled air conditioning, private refrigerator, Mp3 docking station. 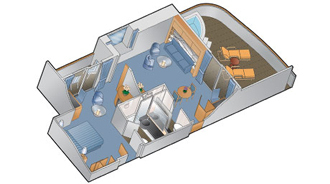 All staterooms include: two lower beds, convertible to queen (except as noted), sitting area, plentiful storage space in your bathroom and wardrobe, flat screen TVs with DVD players, direct-dial telephone, individual safe, desk, thermostat-controlled air conditioning, private refrigerator, Mp3 docking station. 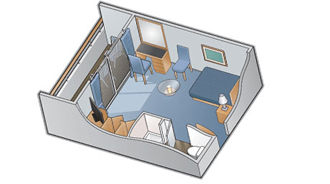 In Stateroom 401, beds cannot be separated. Suite Features: private veranda, free Internet access (3-hour package), leather key holder, two lower beds, convertible to queen (except as noted), Sitting area with convertible full size sofa bed (holds an adult or two children under 100 lbs. each), dual voltage 110/220 AC, plentiful storage space in your bathroom and wardrobe, flat screen TVs with DVD players, direct-dial telephone, individual safe, desk, thermostat-controlled air conditioning, private refrigerator, Mp3 docking station. Veranda: 195 sq.ft. 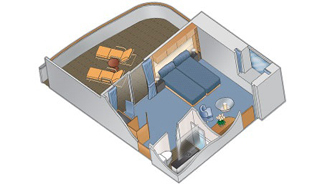 Suite Features: private veranda, free Internet access (3-hour package), leather key holder, two lower beds, convertible to queen (except as noted), Sitting area with convertible full size sofa bed (holds an adult or two children under 100 lbs. each), dual voltage 110/220 AC, plentiful storage space in your bathroom and wardrobe, flat screen TVs with DVD players, direct-dial telephone, individual safe, desk, thermostat-controlled air conditioning, private refrigerator, Mp3 docking station. Veranda: 50 sq.ft. Envelop yourself in warmth and comfort as you curl up with a novel. 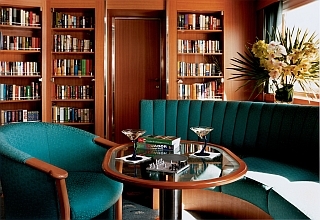 Enjoy the quiet luxury of the library at sea. The Beach Club is a small platform where guests can access Zodiacs.